Haddock up to here with the state of the art world? 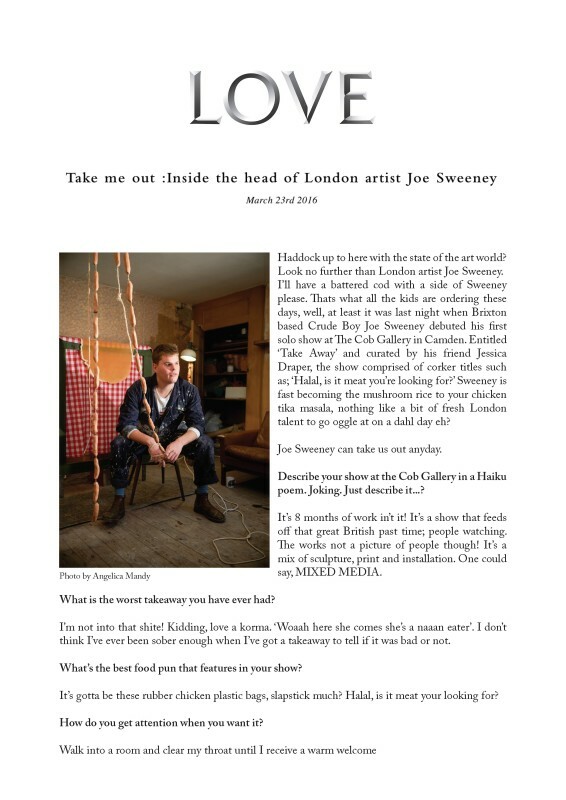 Look no further than London artist Joe Sweeney. I'll have a battered cod with a side of Sweeney please. Thats what all the kids are ordering these days, well, at least it was last night when Brixton based Crude Boy Joe Sweeney debuted his first solo show at The Cob Gallery in Camden. Entitled 'Take Away' and curated by his friend Jessica Draper, the show comprised of corker titles such as; 'Halal, is it meat you're looking for?' Sweeney is fast becoming the mushroom rice to your chicken tika masala, nothing like a bit of fresh London talent to go oggle at on a dahl day eh? Joe Sweeney can take us out anyday.